Explore one of Britain’s most popular coastal regions with our 3 day Brighton and South Downs itinerary. 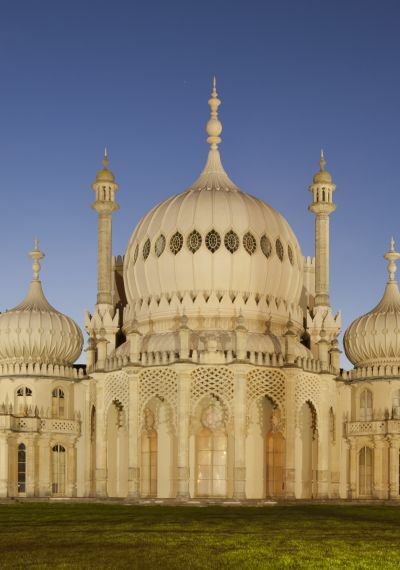 Get to know the bustling city of Brighton and the charming medieval town of Lewes. You’re right in the heart of the gently rolling green hills of the South Downs here, and the dramatic Seven Sisters Cliffs are a short train ride away, so it’s ideal for exploring the countryside too. For shorter trips like this one, you can book your individual rail tickets in advance through the Trainline, ACP Rail, International Rail and Rail Europe. If you’re making a longer journey, one of the easiest and most relaxing ways to explore Britain is with a BritRail Pass that allows you unlimited journeys, giving you the freedom to explore at your own pace. Stay in the colourful, creative city of Brighton, loved for its seaside walks, independent shops and great live music scene. From traditional pubs to great restaurants, fantastic shopping, the magnificent royal palace known as Brighton Pavilion and a fantastic city buzz, there’s plenty here to keep you busy. Brighton Station is right in the centre of the city, so you’re within easy walking distance of most of the city’s main attractions, from the pier to the historic shopping district known as the Lanes. Take a voyage to the depths of the ocean at the Sea Life centre. You’ll see everything from sharks to stingrays, seahorses, turtles and more, while you learn all about life underwater, conservation and the animals' feeding habits! You can get here from the station on foot in 10 minutes. Brighton’s historic pier is an iconic part of the seafront. Come here for fairground rides, the entertainment arcade or just a relaxed stroll. You can pick up some Brighton Rock, or just get some great seaside photos! It’s just a 10 minute walk from Brighton Station. The beautiful medieval town of Lewes is a true rural idyll, complete with its own historic castle. It’s famous for its yearly bonfire to commemorate Guy Fawkes night, which sees a lively procession through the streets with burning pitch barrels and live music. Lewes is a regular 15 minute train journey from Brighton. Lewes Castle is a true piece of history. Around 1,000 years old, it was built by the Norman invaders in the 11th century, and is one of only two castles of its kind in the country. Climb to the top of its tower for fantastic views across the Sussex countryside, then stop by the Museum of Sussex Archaeology in the adjoining Barbican to learn about the area’s history. Lewes Castle is a 5 minute walk from Lewes Station. Visit the house of King Henry VIII’s fourth wife, Anne of Cleves, and learn about this colourful king through one of his many brides. It’s a beautiful Tudor townhouse which will give you a taste of life in the 16th century, from its authentically furnished kitchen to its traditional Tudor garden. It’s just a 5 minute walk from Lewes station. The Glyndebourne Opera Festival is a major event on opera lovers’ calendars, and a great way to make the most of the British summer. Held in an opera house on the grounds of an English Country house, it’s an ideal setting for opera and perfect for picnics before the performance. You can jump on a shuttle bus to and from Lewes Station to get there. You’ll need to book tickets in advance. Experience some of Britain’s most iconic and captivating countryside in the South Downs. This range of rolling hills, woodland and fields ends at the coast in some truly dramatic cliffs, known as the Seven Sisters. Set off on an afternoon stroll, or make a day of it with a long hike through this beautiful landscape. Climb to the top of this gorgeous valley to take in one of the most majestic views in the South Downs, over the hills and forests of Sussex and out over the sea. Its name comes from an old myth that the great dyke, or ditch, was dug by the devil! Catch the 77 bus from Brighton Pier to get here: it runs a regular service on weekends throughout the year and 7 days a week June-September, and the journey takes about 30 minutes. For more information see the website here. Walk some of Britain’s most iconic landscapes on the dramatic coastal chalk cliffs of Seven Sisters Country Park. Take in the incredible sea views from the high cliffs, or head down to the beach via Birling Gap and go fossil hunting. If you’re feeling intrepid, this is a great place to get started on the South Downs Way, one of Britain’s National Trails. To get here, catch the 12, 12A, 12X or 13X bus from Brighton, Churchill Square to Exceat, the journey takes about 1 hour. For more information see the website here. A castle has stood in Arundel since the 11th century, and its impressive façade can be seen for miles around, standing out against the surrounding woodland of the Sussex countryside. Today’s castle saw extensive remodeling in the 18th and 19th centuries, after sustaining damage during the English Civil War, and today is a fascinating mix of medieval fortification and Victorian stately home. Check the calendar for exciting events and knightly re-enactments of sieges and battles. To get here catch the train from Brighton to Ford, then change for Arundel: the whole journey takes about an hour and 5 minutes.